This all aluminum 500-lb. capacity aluminum ladder rack requires absolutely no upkeep. Ladder rack is constructed with heavy duty 1 1/2" square cross supports, set deeply into 2" square uprights. Extra wide 8" mounting bases and clamps secure uprights to drip rails for maximum support and stability without drilling holes in your vehicle. Ladder stops adjust on the width of cross supports to help hold ladders in place. Uprights have 5/8" diameter tie down holes to accommodate hooks, ropes,etc. when securing your load. Available in either 2 or 3-cross support models for all full size vans. For extra protection and long wear, ladder racks have a thick powder coat finish. It may be necessary to cut cross supports on some vans with contour roof designs. Please specify vehicle year, make and model when ordering. 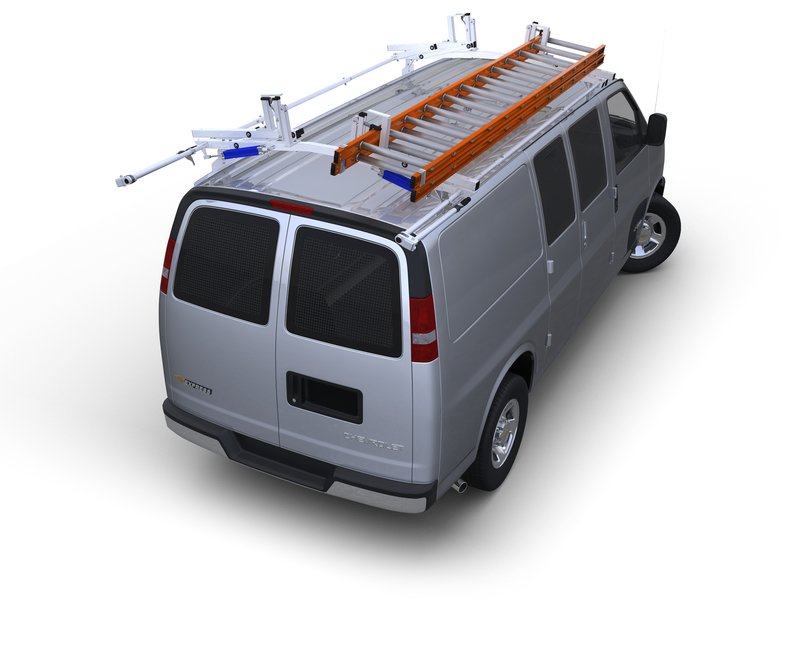 Occasionally, due to changes in aerodynamics caused by the installation of ladder racks on a van, some vibration may occur. This can happen with any ladder rack and is not predictable. If you experience this problem, order our aluminum air foil to help eliminate the vibration.